The Keystone XL tar sands pipeline has turned into one of the most hotly debated topics in North America. There are so many ways to debate about the pipeline and the tar sands oil that would fill it. But, what does it mean when 10 Nobel Peace Laureates, including former U.S. president Jimmy Carter and landmine activist Jody Williams, take a stand and call for a rejection? The Keystone XL tar sands pipeline has turned into one of the most hotly debated topics in North America. Jobs, oil, economy, risk, energy security, climate, water, politics... There are so many ways to debate about the pipeline and the tar sands oil that would fill it. But, what does it mean when 10 Nobel Peace Laureates, including former U.S. president Jimmy Carter and landmine activist Jody Williams, take a stand and call for a rejection? It means that beyond Big Oil's slick PR, all the talking points, and the number crunching that there is a much bigger matter is at hand: morality. In a world already suffering the impacts of a changing climate and fossil fuel extraction, rejecting the pipeline is the only option if U.S. President Barack Obama and Secretary of State John Kerry want to be on the right side of that long moral arc that bends towards justice, as Martin Luther King Jr. so famously put it. Every year hundreds of millions of lives and livelihoods are impacted by global warming. From catastrophic extreme weather in the world's most vulnerable regions to devastating flooding, forest fires and heat waves in our own backyards, climate change is not someday, somewhere. Climate change is here and now. The latest reports from the Intergovernmental Panel on Climate Change (IPCC) continue adding to the mountains of robust science, which tells us just how bad the situation is and what needs to be done to fix it. The bottom line is this: With ambitious action to reduce pollution and quick movement towards advanced energy economies, we can still avoid the worst of climate catastrophes, but every day of missed opportunities for climate action makes it harder and more expensive to do so. The solutions, such as clean, safe renewable energy, are at our fingertips. Across the world, advanced energy economies are taking off. Investing in these solutions is not just good for our climate, it's good for our pocketbooks too. In 2013, global investment in clean energy was 254 billion, a 400 per cent increase in less than a decade. By 2030, Bloomberg estimates that investments in clean energy will make up 73 per cent of all energy investments. This is where the future is. Ambitious action to tackle climate change requires politics that redefines business as usual. It needs political leadership that puts the well-being of the world and a safe future ahead of short-sighted political motives. Averting dangerous climate change will mean kicking our dangerous fossil fuel addiction, starting by saying no to tar sands pipelines, and to recklessly expanding the tar sands. Tar sands are high cost, high risk, and high carbon. In a world tackling climate change, these types of fossil fuels have to be the first to go. The Nobel Peace Laureates, who wrote to President Obama and Secretary Kerry, come from very different realities, struggles, and passions. But their shared view that a decision on the Keystone XL tar sands pipeline is one of right versus wrong speaks volumes. "As you near a decision on the Keystone XL tar sands pipeline, please do not underestimate its importance. While the climate crisis will require increasingly ambitious efforts to keep global warming below 2 degrees Celsius, this moment has the potential to empower a generation that needs affirmation that their leaders are listening and care about their future. A rejection would signal a new course for the world's largest economy. You know as well as we do the powerful precedent that this would set. This leadership by example would usher in a new era where climate change and pollution is given the urgent attention and focus it deserves in a world where the climate crisis is already a daily struggle for so many." The President's decision on the Keystone XL tar sands pipeline will set precedents, change markets, and shift paradigms. But it will also build legacies. It will not be the last or the only action needed to protect our future -- far from it. But there has never been a bigger moment when it comes to defining a new world of climate action than this one. 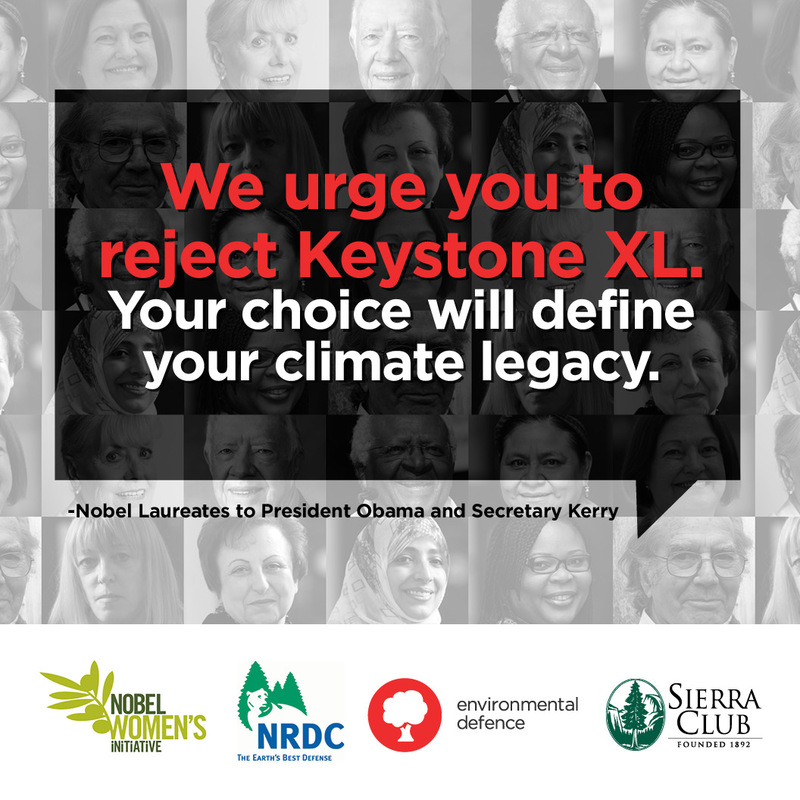 Like the Nobel Laureates, in solidarity with the millions across the continent that are calling for a rejection of the Keystone XL tar sands pipeline, we too hope that we can soon write a letter to the President thanking him for taking a meaningful step towards a safer future. Check out our new report Reality Check: Climate Change and the Tar Sands here.